A Revolution in 3D Scanning We’re thrilled to announce that today’s MakerBot® MakerWare® 2.4 release includes MakerBot MultiScan Technology, a feature that will forever change the way you create 3D models with the MakerBot® Digitizer™ Desktop 3D Scanner. We developed MultiScan so you could scan objects from multiple angles to create the best possible 3D models. Now you can capture the top, bottom, and hidden parts of your object, and experiment to optimize your 3D models. More Complete Coverage MultiScan improves scan coverage by allowing you to “merge” two or more scans of an object, each taken from a different position. You can scan an object vertically and horizontally, or from any angle that the object can be positioned on the turntable. MultiScan takes your MakerBot Digitizer experience to an exciting new level. Now you can capture more data from objects with complex geometry and occlusions, which are parts of the object that block the laser from other parts of the object. 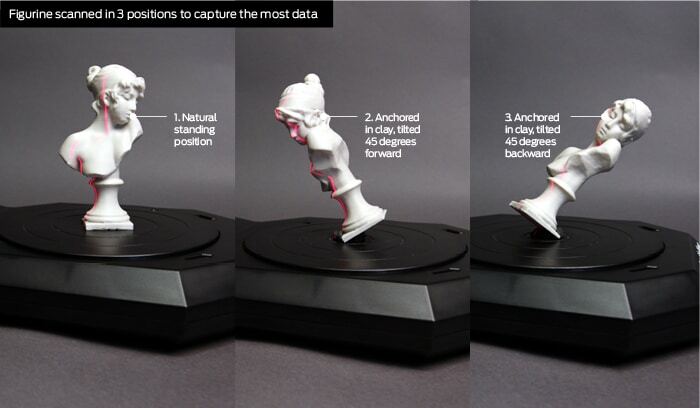 For example, you can grab more detail off this figurine by scanning it several times tilted in different positions. Broader Capabilities, Increased Versatility MultiScan opens up new categories of objects to scan, particularly ones that would have come out less detailed if they had only been scanned once from one position. In the image below, the angel wings occlude other parts of the object. When scanned from one position, much of that detail is blocked or not picked up. But when scanned four more times,—once from each quadrant of the turntable, and facing the same direction every time—the laser is able to reflect once-blocked sections of the object back to the camera. Then MultiScan combines all the data to create a more robust 3D model. A quick note: We’ve found that after five scans, the quality of a 3D model doesn’t improve much more, and could even degrade. For most objects, two or three should do the job. Revived by MakerBot MultiScan Technology A cool story of how MultiScan makes 3D scanning even more awesome comes from a member of our MakerBot team. 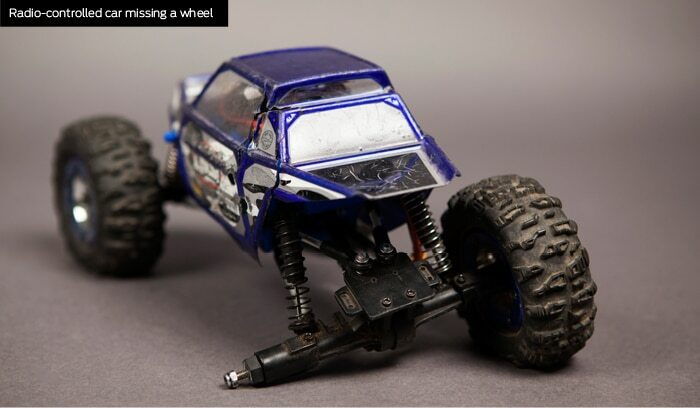 His favorite radio-controlled car was missing a wheel, and he couldn’t find a replacement. To fix it, he removed one of the wheels and prepared it to be scanned on the MakerBot Digitizer. Using MultiScan, he scanned the wheel, resulting in a great 3D model of the wheel. He then printed it on his MakerBot® Replicator® 2 Desktop 3D Printer with MakerBot® Flexible Filament. After a few minutes of prep work to make sure the new tire fit the axel, his radio-controlled car was ready to roll. Accelerate Your MakerBot Digitizer Experience Now that you have a taste of how MultiScan can expand the possibilities of 3D modeling, we hope you’ll explore and share what you create with the Thingiverse community. The methods you discover and designs you produce are the fuels that keep the Next Industrial Revolution moving forward at full speed!